Almighty and everlasting God, creator of time and space of season and epoch, of birth and evolution of both living creatures and galaxies alike, hear us as we humbly come before you as we mark our brief passage of time as another year begins. We have heard the Christmas story, about how you, Father, came to live among us. As we try to understand what this means in our lives we pray that you will guide us in our requests for others in our prayers of intercession. Lord we thank you that you promised the possibility of making a fresh start at any time and not just as part of some half-considered new year resolutions. Help those who have recently made important decisions in their lives to see them through. Life is full of pressures which often pull and push us in directions we would, and should, not normally take. Give us strength of purpose and faith in you to take decisions seriously, to understand the consequences for others, as well as ourselves, and, always, to seek your guidance through prayer. At the start of this new year we are reminded of the worlds deafness to the message of peace sung by the Christmas angels. Preparations for war with Iraq rumble inexorably on with each new pronouncement on the seeking of a peaceful settlement. We also imagine how un-silent is life in today's Bethlehem and across Israel and Gaza. We pray for all caught up in conflict or its preparations. We think of British service men and women facing the uncertainty of action so far from home in Irag and Afghanistan. Father, give strength and courage to all peacemakers that they will not be dissuaded from the difficult decisions needed to bring about an end to open conflict or acts of terrorism. We also pray for Zimbabwe and the humanitarian crisis, seeking responsible government and an end to oppression. We pray for this, our own, country with its cultural and ethnic diversity, for Queen Elizabeth, our head of state, her ministers and all in authority, that they will govern wisely and with due regard for the needs of all people. We pray for all our people facing this New Year without some of the basics of life that we take so much for granted. We think of the homeless, the unemployed, the asylum seeker, the addict, the ex-prisoner. Lord Jesus who became a refugee from the oppression of Herod be with all those who find themselves marginalised from our affluent society. Support all who work through state and voluntary agencies to relieve their hardship and restore dignity. We pray for all families represented here today. Each one is made up differently and faces the normal ups and downs of family life in different ways. We remember that Jesus was born, nurtured and grew up in a family which would have known all the emotions that we know in ours. We pray that each family finds a place for that selfless love, revealed to us through the life, teachings and example of our Lord. We Pray for the world-wide church and pray especially for all peoples facing religious intolerance often by those who distort the teachings of their own faith for political ends. 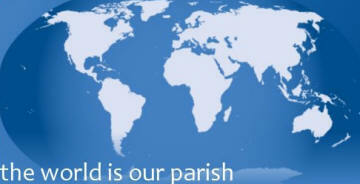 We think now of our Church here at St. Mark's and our sister church in the partnership at Putnoe Heights. We pray for our ministers and leaders, guide and support them and all who contribute to the Church's vision of service and witness. We pray for the sick, both at home and in hospital, or hospice. We think of the elderly, the housebound and those in care homes. And we pray for all who care to their needs, both professionally and in the family. Lord Jesus who responded to the needs of all those who had faith; comfort and sustain those who are in need of your grace at this time. As we share a moment of silence together, we bring before you those known only to ourselves and name them in our hearts. Especially do we pray for those who mourn the loss of loved ones, whether recently or some time ago. Let the knowledge of your resurrection in glory be comfort to all those who mourn.